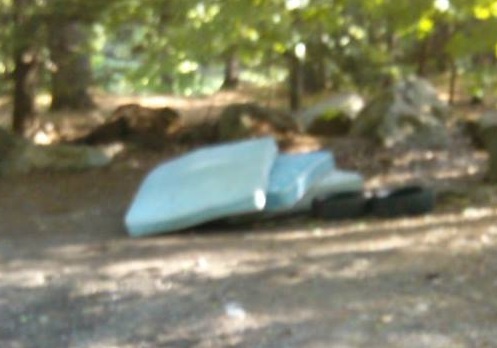 This is one of the three illegal dumps I know of in Lisbon. Proponents of PAYT (pay as you throw trash programs) will tell you PAYT doesn't increase illegal dumping, this is blatantly untrue. Mr. Travis Blackmer, a researcher at the University of Maine who studies PAYT stated the following in a letter. The towns utilizing PAYT confirmed our views. Towns that did not have PAYT had a consistent question: where does the waste go? Looking at a handful of towns we saw that waste tonnages were cut in half on average, but only 1/4 of that waste reduction ended up in the recycling stream. For larger Maine municipalities, that is over 100 tons of waste that had (or would be expected to) evaporate. Does anyone doubt that a good percentage of the lost tonnage ends up in illegal dumps? Call your Councilors and tell them you don't want illegal dumps in Lisbon.